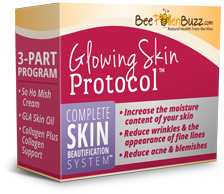 Combine with the So Ho Mish Miracle Cream and GLA Skin Oil for glowing, wrinkle free skin! Take 4 capsules per day with food. Clinical research showed after 28 days, taking 2000 mg of Active Collagen per day significantly reduced the number of deep wrinkles and improved the moisture content of the skin.